Is there a better alternative to GistTool? Is GistTool really the best app in Developer Tools category? 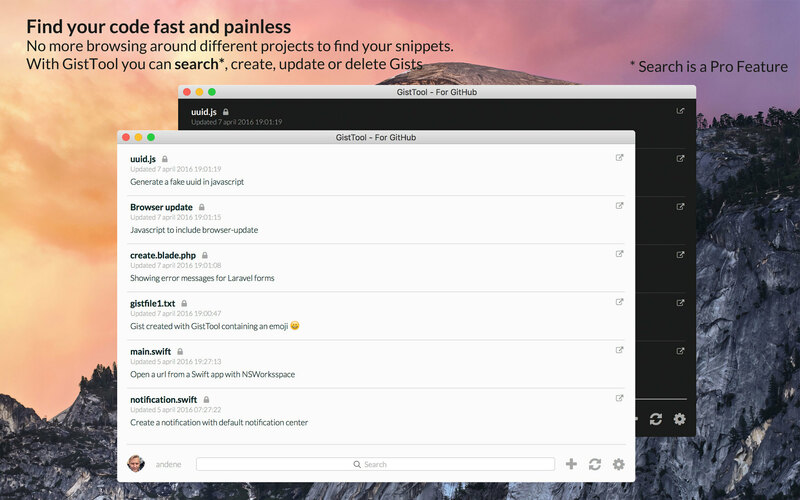 Will GistTool work good on macOS 10.13.4? GistTool is an app for managing your gists on the Github Gist platform. It supports searching*, creating, updating, and deleting gists, including gist-files. Using OAuth2 you can feel secure when logging in to your Github account. With Pro Edition you can easily find your gists by searching, which allows you to find your code snippets very fast. Another nice feature is a copy-to-clipboard button which allows you to copy the content fast. GistTool needs a review. Be the first to review this app and get the discussion started! GistTool needs a rating. Be the first to rate this app and get the discussion started!